Tabletop Workshop, by popular demand, has created their Large Castle Set that you can order over in their webshop. The set brings together 23 of their kits into a single set. You get both castle pieces (walls, turrets) and regular houses and shops, perfect for created a defended hamlet, or fill a whole tabletop with a medieval town. The set is 30% off vs. if you bought all the pieces separately. Quite a deal! Go check it out. 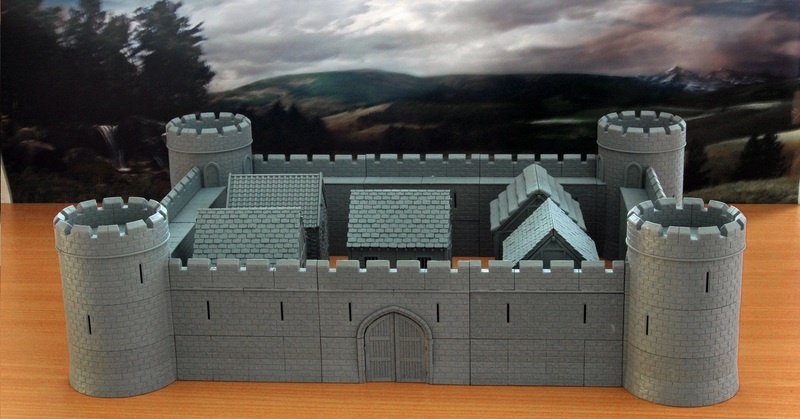 The Tabletop Workshop 28mm Large Castle Set offers fantastic opportunities. For the first time ever, gamers get a fully modular, stackable 28mm Castle. Walls can be built up to be as big or small as the creator desires. Not everyone wants a square Castle. That’s why we’ve designed the Tower and Walls to connect at four different angles through the Connector Sets. In fact, you can join your Towers and Walls at 90°, 120°, 150° and 180°! With more Towers, Walls, Wall Gates and Connector Sets, you can build even more shapes to be the home of your armies. The 28mm Castle is more than a Castle. It’s the beginning of a whole new system of terrain that can be expanded over and over again! The Large Castle Set is now available from the Tabletop Workshop Webstore and consists of 4 Round Towers, 8 Walls, 2 Wall Gates, 4 Connector Sets, 2 Merchant’s Houses, 2 Town Houses and a Medieval Chapel.